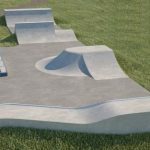 Stourport skatepark is a large all concrete park that can be found on the banks of the Severn and features a mixture of street and transition elements. The skatepark is split into two main sections, a back and forth part and a bowl section. The back and forth run consists of a flat bank and a quarter pipe facing each other with a funbox in between that holds a hipped bank, driveway and jump box. The bowl here is rectangular and has an extension on one corner and a spine leading onto the street section. There is also a stair set with rail that leads from the top platform down to the street section as well. 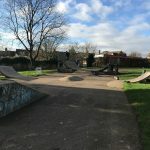 Stourport-on-Severn skatepark is a great local park with something for everyone. 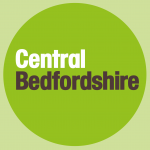 The selection of obstacles is decent and the concrete surfaces mean that it is a great place to come whether you are a beginner or a more experienced skater. 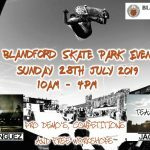 Kidderminster train station: As it is such a long distance from the station it would be recommended to get a bus or a taxi to get to Stourport skatepark. Swimming Pool bus stop: Exit the bus onto Bridge Street and head north, crossing over the river and taking Raven Street on your left. At Martins Way turn left and follow the road until Stourport-on-Severn is in sight.